Fourth in a multi-part series AT THE MILL. for the construction of building No. 1. Structure in left corner is chimney. 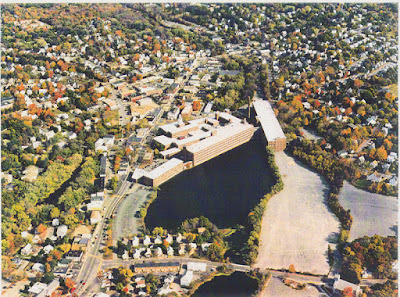 The rapidity of the construction was all the more remarkable because room for the foundation on the south side had to be blown out of solid rock (explosives likely bought from the American Powder Mill, down the road), while the north side required a temporary dike in the millpond to allow for the pouring of concrete. The article describes the work crew as numbering 500, more than half of them Italian laborers, working day and night. Carting was contracted locally, so there was full employment for horses, too. Completed, the building spanned 690 x 106 feet, five stories above a basement, so providing more than 400,000 square feet of floor space. Two floors were dedicated to looms, with the other floors providing space for carding, spinning, dressing, spooling and drawing-in. 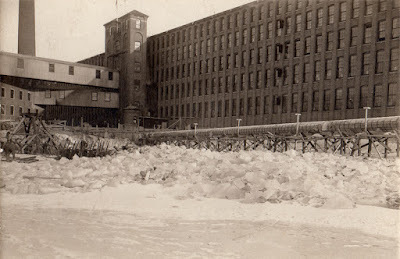 Each floor of the mill was powered by electric motors and illuminated by electric light bulbs, with the electricity produced by the mill’s own coal-fired, steam-powered generators. Floor-to-ceiling windows added natural light. not yet been built (No. 3, middle, 1911 and No. 1, left, 1918). 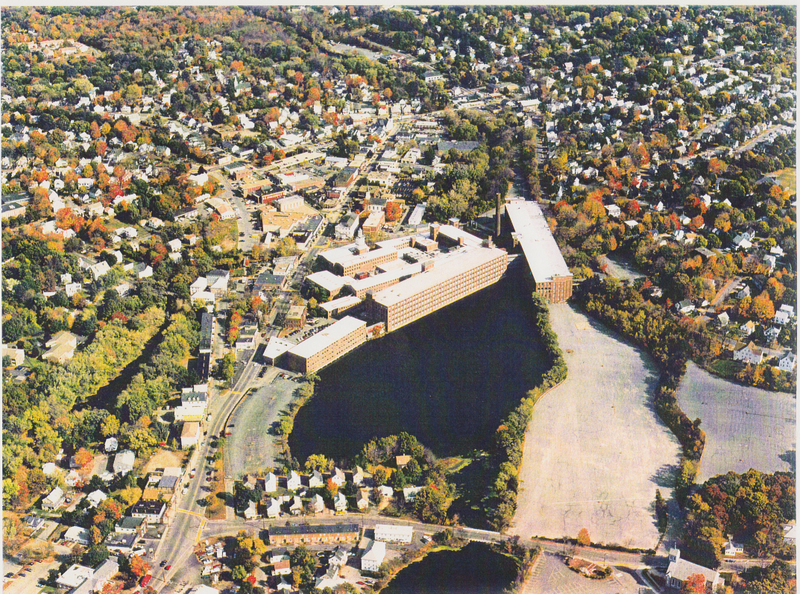 Bringing this new building on line more than doubled working space at the American Woolen Company operations in Maynard, and brought employment to 2,000 men, women and teenage children. 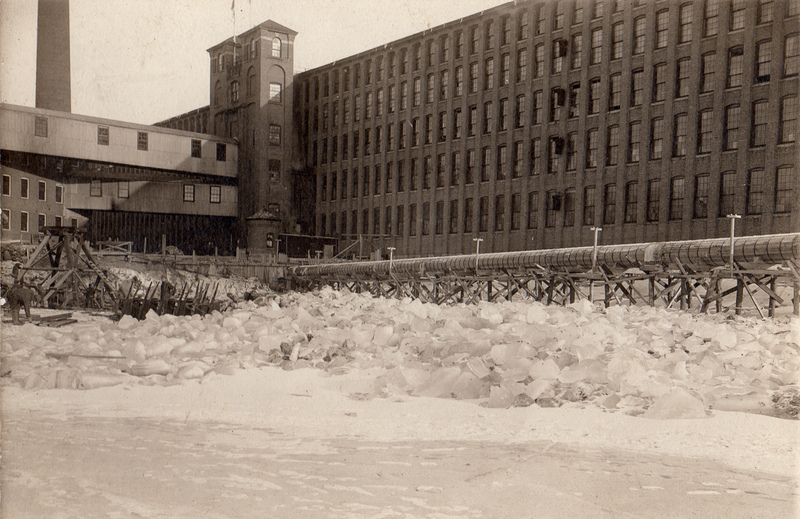 The town’s population reflected the mill’s expansion, more than doubling from 3,100 to 6,400 between 1900 and 1910. These were the years that brought so many European immigrants to Maynard. Current occupants of building No. 5 include Stratus Technologies, which leased a bit more than 100,000 square feet starting summer of 2015, and the Battle Road Brewery and Brewhouse, open for business February 2017. The brewhouse has outdoor seating overlooking the millpond (weather permitting). 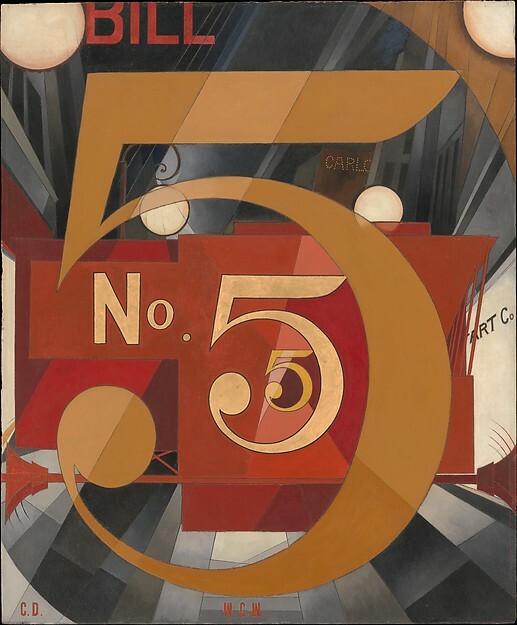 “Five” has figured mightily in American art. Circa 1920, the poet William Carlos Williams published “The Great Figure,” a poem that in 32 words captured the cacophony of moment and sound on a hot, July, city night: “Among the rain/ and lights/ I saw the figure 5/ in gold/ on a red/ firetruck/ moving/ tense/ unheeded/ to gong clangs/ siren howls/ and wheels rumbling/ through the dark city.” The poem scrolls down the printed page, short line after short line, but when read aloud, not too fast, but without pauses for commas (because there are no commas), it is a tone poem, and itself whole. As told by Williams to a friend, he was so struck by the sight and sound of the firetruck that he took paper and pencil out of his pocket and wrote the poem – or at least the kernel of the poem – standing there on the sidewalk. original is 30 x 35 inches. Click on images to enlarge. In 1928, inspired by Williams’ poem, American artist Charles Demuth painted “I Saw the Figure 5 in Gold.” The work, in oil paint, graphite, ink and gold leaf, is 30x35 inches. Between 1924 and 1929, Demuth completed eight abstract paintings as tributes to modern American artists, writers, and performers. Demuth left the painting in his will to Georgia O'Keeffe. She in turn bequeathed it to the New York Metropolitan Museum of Art, where it resides. The three 5’s in the painting and the partial curve of a fourth convey that image of the firetruck receding away from WCW that night. The rest is a city street, store windows, street lights and a subtle scattering of references to the poet. For anyone with a computer, it’s worth a search on the painting’s title for a screen viewing. In 2013 “I Saw the Figure 5 in Gold” was one of twelve works of art featured in stamps issued by the U.S. Postal Service. For dollhouse collectors, it is possible to purchase picture frames that are a good size match for postage stamps. What a way to collect famous paintings for a fraction of the cost (at a fraction of the size). "I Saw the Figure 5 in Gold"
Which is exactly what I did. On eBay, I was able to buy the stamp from one vendor and a "Dollhouse double matted gilded Victorian picture frame miniature (from Jacqueline's)" from another, combined cost about $12.00. The frame included a rectangle of clear acetate to simulate glass. The size of stamp and frame is 1:24 inch scale, meaning 1 foot is 1/2 inch. This is a popular size for adult dollhouse collectors in the U.S.; in Great Britain a 1:12 scale is more common. Sometimes, collectors want their dollhouse to have a dollhouse. This calls for the dollhouse to be 1:12 scale and the D-in-D to be 1:144 scale. People doing stop-motion animation may work in 1:6 scale, meaning 1 foot is two inches, and characters therefore 8-12 inches tall. Often heads, hands and feet are disproportionally large so as to not look too much like miniature people. This also allows for more detail on face construction and movement without the characters getting too large. Barbie and the early G.I. Joe action figures are 1:6 scale. The action figure hero and villain market (think comic book and sc-fi movie characters) tend to be in 1:10 scale. These are often used in adult audience intended stop motion animation, as seen on the cable TV channel Adult Swim, meaning that sets and props need to be custom made rather than dollhouse standard sizes.